CarGurus has 21,695 nationwide Suburban listings starting at $1,995. Still big and bold, and still intended for a select audience, Chevrolet’s 2016 Suburban full-size SUV balances practicality with value and throws in a bunch of standard perks besides. Although the Suburban nameplate has been around since the 1930s, this upcoming year’s offering returns as the well-known 5-door, 7- to 9-passenger behemoth that sports all of today's expected creature comforts, totes up to 121.1 cubic feet of cargo, and packs a competent V8 powerplant. Trims remain the base LS, the up-featured LT, and the top-shelf LTZ, each bearing the half-ton 1500 designation. All variations return delivered in the standard rear-wheel drive (RWD) configuration, while each again remains eligible for available 4-wheel drive (4WD), lately offered in either a single-speed-transfer-case version or packing an available 2-speed transfer case featuring high-low gearing. Furthermore, all trims, RWD or 4WD, again sport a standard locking rear differential. A hefty redesign of the Suburban for the 2015 model year leaves this chunky Chevy sporting few noteworthy changes for 2016. A couple of new exterior colors, Siren Red Tintcoat and Iridescent Pearl Tricoat, debut, as does a new liftgate shield, a few tweaks to standard and available techno-goodies, a cap-less fuel filler, and some upgrades to the safety-oriented Driver Alert package, including a heads-up display and lane-keeping assistance. Additionally, IntelliBeam automatic high/low-beam headlights are now standard across the Suburban trim spectrum. 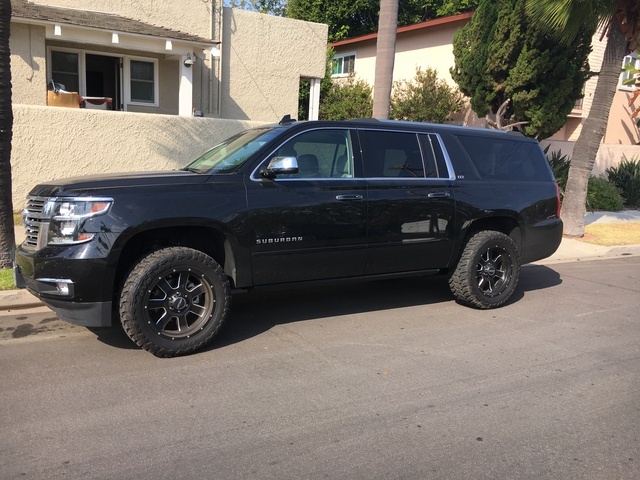 Again, the 2016 Suburban stable packs a 5.3-liter V8 powerplant mated with the ubiquitous 6-speed shiftable automatic transmission to the tune of 355 hp and 383 lb-ft of torque. Mileage will doubtless remain estimated at 16 mpg city/23 highway/18 combined in RWD versions and 16/22/18 in 4WD trims, while towing capacity returns at a maximum of 8,200 pounds in RWD iterations and 8,000 pounds in the 4WD editions with the proper equipment installed. Returning appearance features for the upcoming year’s Chevy sport ute include 18-inch alloy wheels on the LS and LT trims, with the LTZ boasting 22-inch alloy wheels. All iterations also remain toting a roof rack, a Class II trailer hitch and wiring, and heated power-adjustable mirrors (with integrated turn signals in the LT and LTZ). The LS also returns with standard rear parking sensors, while higher trims again feature parking sensors at both front and rear, while the rear-view camera is again standard for all 2016 trims. Inside, look for the Suburban LS to sport premium cloth upholstery, with the LT and LTZ featuring leather seats and cabin accents. All trims again offer standard power-adjustable front seats, with said seats heated in higher trims. Full power accessories also remain standard in all trims, as do cruise control, telescoping tilt-wheel steering (power-adjustable in the LTZ), and tri-zone automatic climate control. Memory for driver's settings is once again slated to remain standard in the flagship LTZ, which also returns with heated power-folding second-row captain’s chairs (which limits the Suburban to 7-passenger seating). For 2016, all Suburban iterations will again boast Bluetooth-interfaced OnStar Directions & Connections telematics, while higher trims also throw in MyLink infotainment with an 8-inch touchscreen display and smartphone apps. Be advised, alas, that the folks at Chevy are expected to delete the once-standard CD player and the SD card slot for the upcoming year’s Suburban lineup, thus the LS and LT return hosting satellite radio, new-for-2016 HD Radio, and an auxiliary audio input. The LS, meantime, again features 6 speakers, while the LT carries 9. The LTZ, on the other hand, is expected to again boast a Bose premium stereo with 10 Surround Sound speakers. Options-wise, look for 2015’s debuting 4G LTE WiFi hotspot technology to again be available in higher 2016 Suburban trims, along with a power sunroof, GPS navigation, and a Theft Deterrent package. All trims, meanwhile, are slated to remain eligible for the Max Trailering package, which includes a load-leveling suspension for the LT and LTZ iterations only. Additionally, those higher trims again return in the running for available upgraded and upsized wheels, power-extending step running boards, and rear-seat DVD/Blu-ray entertainment. Only the LS, by the way, offers available bench seating in all 3 rows for up to 9 people, while the LT can be configured to carry second-row bench seats for 8 passengers in place of the standard bucket seats. Once again, the LTZ, with standard second-row captain’s chairs, continues to offer seating for 7. Standard safety features expected to return aboard all 2016 Suburban iterations include 4-wheel antilock brakes (ABS), traction and stability control, front side-mounted airbags, 3-row head airbags, and GM’s unique center-mounted front airbag system that’s designed to prevent front-seat occupants from slamming into each other in a side-impact collision. Additionally, daytime running lights will doubtless return in all trims, along with a post-collision safety system, OnStar emergency alerts and communications, and a remote antitheft alarm. Again, the LT and LTZ are scheduled to return sporting standard front fog/driving lights, while the LTZ is expected to tote the upgraded-for-2016 Driver Assist package as standard equipment, with this package offered as an option in the LT. And it should be noted that the government gives the current Suburban a top-shelf 5 stars overall in its various safety protocols. Those who drive the reworked 2015 Suburban have grown to accept its less-than-stellar mileage numbers as the price to pay for this behemoth’s roomy cabin, hefty towing and cargo capacities, commanding driving height, and wealth of features. On the downside, owners have lamented continued frustrations with the MyLink infotainment system, along with concerns that the power-folding third-row seats don’t lie flat. Look for the 2016 Suburban to adorn dealer showrooms in the late summer of 2015, when it will once again go head to head with Toyota’s well-wrought Sequoia and Ford’s techno-heavy Expedition, as well as its similarly equipped GMC Yukon cousin. 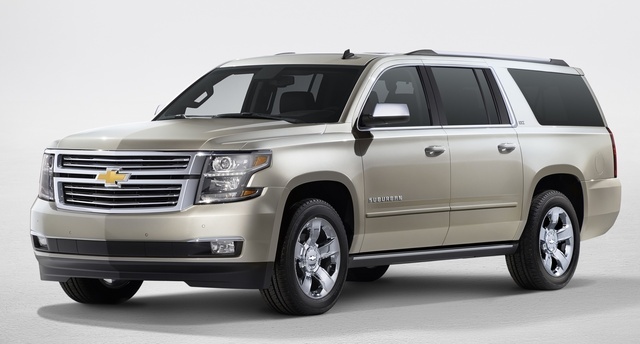 What's your take on the 2016 Chevrolet Suburban? tigerdoc The LTZ is now configurable with the 2nd row bench. There is also a new Slate Gray color available. Users ranked 2016 Chevrolet Suburban against other cars which they drove/owned. Each ranking was based on 9 categories. Here is the summary of top rankings. Have you driven a 2016 Chevrolet Suburban? I’m in NC looking for anyone who would want to swap my 2016 heated/powered black leather bucket seats for 60/40 bench, warmedic@hotmail.com or text 8287350312 thanks.